Otto is by far the most complex rig I have built. 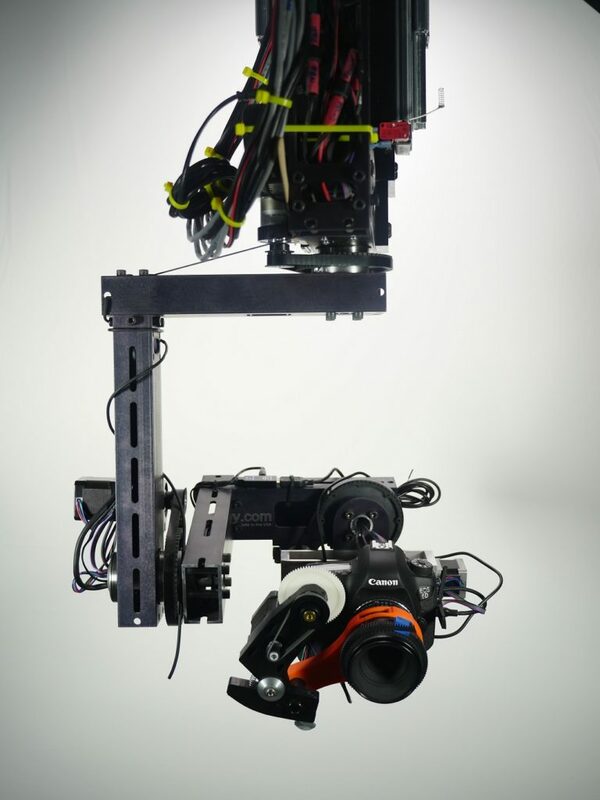 This is a photography robot with 8 degrees of movement. 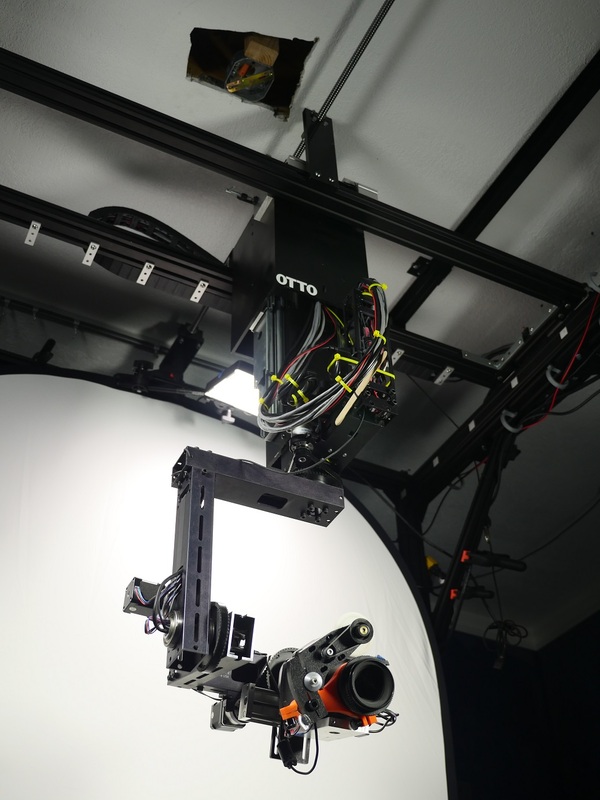 Using an overhead gantry system and an elevator it allows for the X/Y/Z motion, along with a modified Servocity PT-2100 Pan/Tilt/Roll, and a lens mounted focus unit made from a custom bracket and a Lens Apparatus. Add in a micro slider under the camera for Stereoscopic 3D filming techniques. The name “Otto” is a nod to Wall-E with the “Auto” pilot which tried to take over. It took about 7 months to complete the build from concept to reality. I tried to use as many quality “off the shelf” components as I could to make it easier, but I still had to overcome quite a few engineering hurdles ad design it from the ground up. The frame is black anodized 80/20 30 series aluminum extrusion. This provides it with quite a bit of strength, and the channels in the aluminum allow for very easy attachment of lights, cameras, accessories, etc. My friend Kyle printed out about 30 cable hooks which I use to keep things clean. There are a LOT of cables running through this system. I am very pleased with how well this frame holds, and standing on top of the concrete foundation in my basement, you can jump up and down next to it without causing the camera to shake. The overhead gantry allows for about 5 feet of motion on the x/y. s some pretty large stepper motors and ball screws on some nice bearings to move around. When the gantry is not connected to the ball screws a light touch will send it slowly rolling with ease. Sometime I would like to add a second ballscrew/motor on the Y axis as that is the largest moving potion, but so far the single seems to work fairly well. 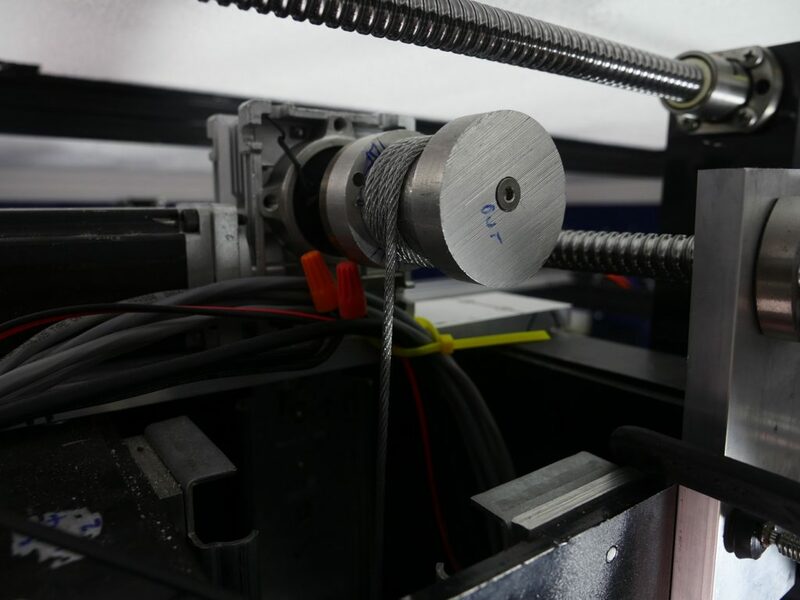 The Z axis is handled by a home made elevator system. This was easily the most difficult part to figure out. My problem is a low ceiling in my studio. 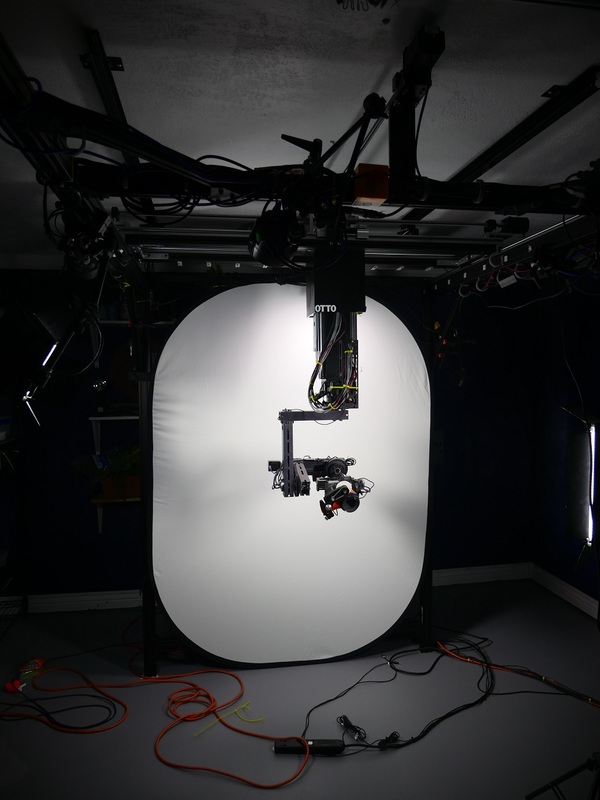 A simple cnc style would result in a camera hanging very low. I went over some designs with scissor jacks, a rail with a pulley at the end, and a few other screwy designs. This one made the most sense, and it could not have gone together better. The heavy duty drawer sliders are doubled up and sandwiched between an 8in square extrusion and a 4in square extrusion. This allows for it to telescope in and out and allow for a much higher drop with a much lower ceiling requirement. It was heavy as hell though, and adding that Pan/tilt/roll, and cameras, and everything else, I was pretty nervous if I could actually lift this. I ended up picking up a heavy duty stepper motor on a heavily geared right angle gearbox. I had to fabricate my own spool as I couldn’t find anything that would work off the shelf. I had put probably around $400-500 in this design and If it didn’t work I was going to be out some money. It was nerve wracking at first, but turns out that winch could probably lift twice as much without flinching. The steel cable does make some creeking though. As far as vertical motion and repeatability, it is excellent, and far more accurate than I expected. The Pan/Tilt/Roll is a modified PT-2100 from ServoCity. It had some excellent hardware and it is very very stout, but after I got it i quickly realized the Roll axis was between the Pan and Tilt. This resulted in a design that if tilted while rolling woul arc the camera around rather than spinning along axis of the lens. Pretty dumb in my view. Luckily this thing is built like a damn tank. I ended up pulling it apart, cutting some parts, and putting it back together with the ROLL in the same axis as the Lens. It also reduced quite a bit of the bulk, and it is still rock solid. Other than that the PT-2100 is fantastic. The bearings are great, its easy to route cables in it, and the motion is super smooth. The conversion to stepper was simple, just swapped the motors. this The whole thing is somewhat heavy, but when its on Otto and powered up, it just effortlessly floats around. Beyond the Pan/Tilt/Roll, beneath the camera I had also installed a tiny 6 inch micro slider. The original intent was to take advantage of Dragonframe’s capability of performing 3d stereoscopic filming. 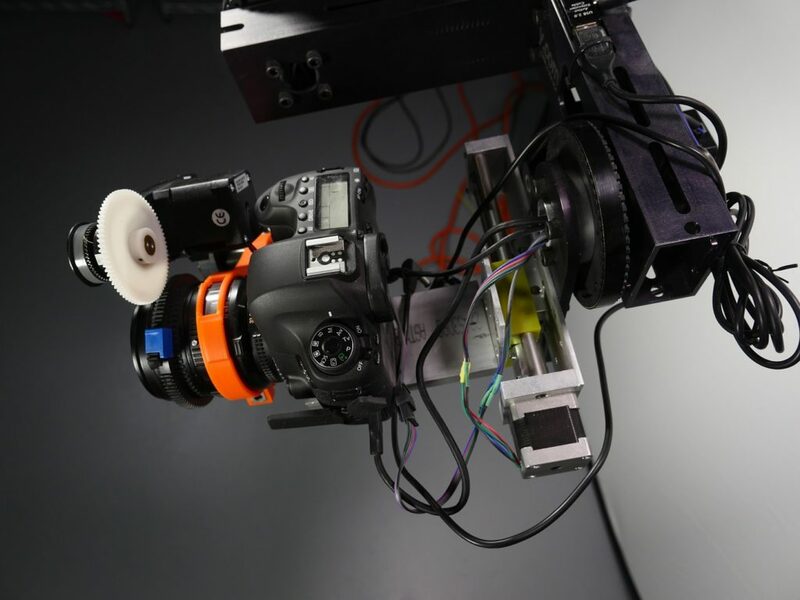 It will control the camera and take each image twice, from 2 different points. This gives the results in 2 perspectives and can be used to create 3d footage. However, I have yet to use it like that. I have found that that tiny 6 inch slider is also great for Macro level linear slide. 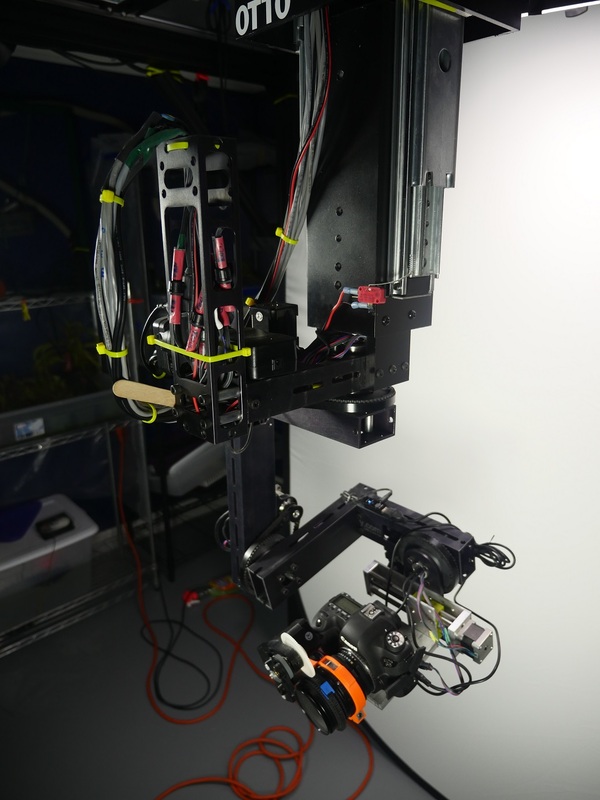 There are times where Otto will be on and running, and after 3 weeks of filming the camera has only moved about 8 inches from its starting point. This little slider really proved handy for those tiny linear moves. On the back end of the system.. There are several key pieces of equipment that allow this rig to function. Laptop running Dragonframe. This is the control software that is used to compose the scenes, position the camera, setup the lighting, etc. 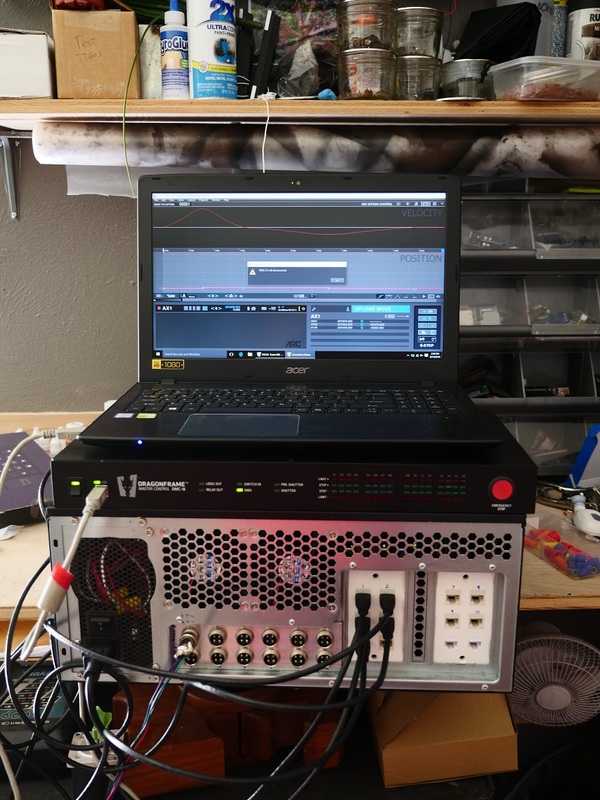 The Laptop creates the scenes, and then uploads the routine to the Dragonframe DMC-16. This is the signal generator that orchestrates the movement for the motors. This is a pretty sweet system. It can handle up to 200,000 step pulses to each motor driver, for a total of 16 drivers. The DMC also provides all the hardwired connections for the external triggers, limit switches, camera trigger, and the connection for the DMX lighting. Motor Power Source (MPS) is a server chassis that I outfitted with ten Stepper Motor Drivers. While the DMC creates the signals, the MPS is what supplies the power and delivers the voltage patterns to the Stepper motors.